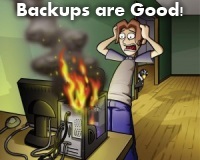 You get Windows Backup all set up, and it’s working fine. You try everything, and it just won’t back up your stuff any more. It keeps giving some error about a failure because it cannot read a shadow copy on one particular volume. You probably also noticed that your antivirus software detected some Java baddies. You dutifully clicked the button to clean the malware, and you thought everything was fine… except that your backup still won’t run! Then you do a search, and you find wonderful advice such as this post on answer.microsoft.com. Did you ever notice that Microsoft’s “Answers” web site is totally useless? Yeah, I noticed that too. What’s worse, the total crap responses from their “experts” are always posted twice, and sometimes 32 times. If they suggest a fix and it doesn’t work, they simply assume that you are a moron, and so they seem to just repost the same answer, again and again. Isn’t that nice? No, it’s not. You could also try this workaround, recommended by MS. Wow, what is THAT all about? I dunno. Go to Organize -> Folder and search options -> View tab -> Make sure “Show hidden files, folders, and drives” is CHECKED. Click OK.
Delete all the numbered folders in the above directory. It seems that what happens is that you get some kind of Java malware (or what is reported as malware) on your puter. It is stored in Java’s cache directory. Your security software sees it, and it claims to delete it. But, either something goes wrong, or it doesn’t quite remove all copies of the baddie, which then causes a problem with Volume Shadow Copy (which is more or less Window’s “file change history” feature that makes things like Previous Versions and Windows Backup work nicely and efficiently). So, just delete the contents of the Java cache folder, and your problem is gone. If the above solution doesn’t work, note what malware your antivirus app is finding, and where it is located. Manually delete the contents of that directory, and try Windows Backup again. Hopefully, this little tip will save you some time and aggravation! Where is the lanscan_help.txt file for lanscan.exe Version 1.52 ? Oops! I added the help file back in to the v1.52 ZIP file. I love Scottie. This shiz works. Thank you! Found something else that it will cause this problem. I had a folder that Windows wouldn’t let me delete, since it said it didn’t exist (had a colon in the file name). But I couldn’t copy it because Windows said it didn’t exist. I discovered this when trying to copy the files to do a manual backup. All I needed to do was run scandisk on the drive I was backing up, and it found and deleted the invalid folder. Now Windows Backup works fine. Aha, that’s good to know. Thanks!